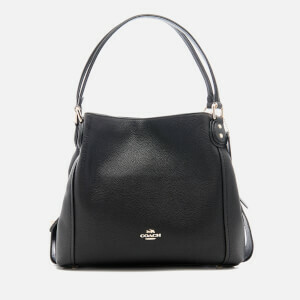 Black pebbled leather shoulder bag from Coach. 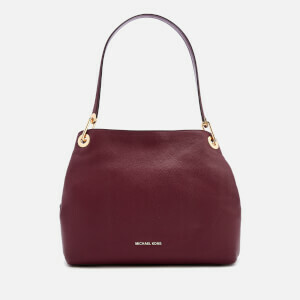 Crafted from polished leather, the slouchy ‘Edie 28’ bag is a smaller version of the original ‘Edie’ bag. 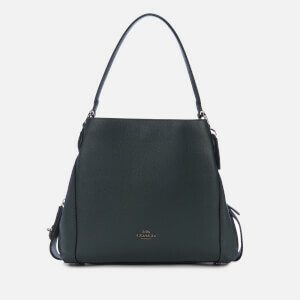 Fastened with a dog lead clip and snap closure, the bag opens up to reveal a fabric lined interior with a zip pocket, a slip pocket and a leather brand patch. 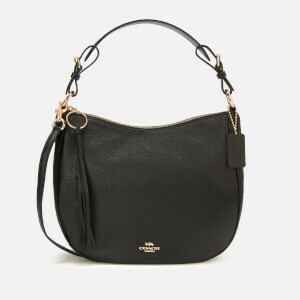 Dual carry handles and a detachable crossbody strap provide multiple ways to style. Complete with gold-tone hardware, a leather luggage tag and signature branding to the front. Dimensions: H: 22.5cm x W: 29cm x D: 12cm. Handle Drop: 15.5cm. Strap Drop: 55.5cm.